This tutorial will teach you how to download Instagram photos to your computer. 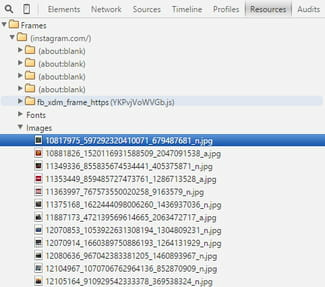 While the social network doesn't offer the ability to download photos, there's a simple workaround that uses Google Chrome's DevTools to retrieve full-size images from Instagram. Open Google Chrome, sign into Instagram, and browse for the desired photo(s). Once found, click Customize and Control Google Chrome (small button with three horizontal stripes) > More Tools > Developer Tools. Right-click on the photo, and select Open in a new tab. The selected photo will open in a new browser tab. Right-click on the photo, and select Save As to download it to your computer. Published by jak58. Latest update on February 2, 2018 at 06:54 PM by Olivia Long. This document, titled "How To Download Instagram Photos to Your PC," is available under the Creative Commons license. Any copy, reuse, or modification of the content should be sufficiently credited to CCM (https://ccm.net/).